A 2016 Deloitte study found a 26 to 33% lift in conversion when shoppers used social media, indicating a strong behavioral influence of digital interactions on purchases. 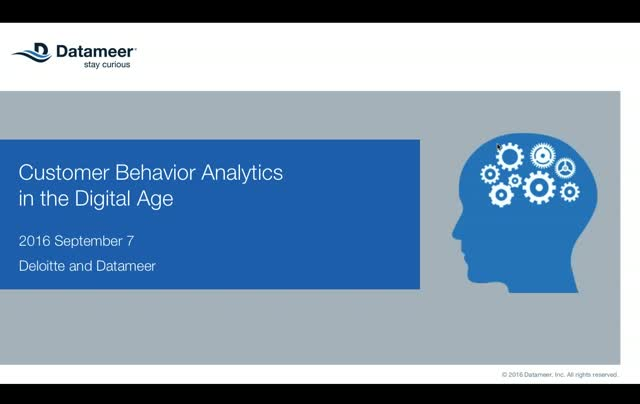 In the digital age, customer behavior analytics are essential to help drive all aspects of the customer lifecycle – acquisition, engagement & retention – and increase revenue during those phases. The big data analytics market has undergone continuous transformation since its’ inception and continued in 2017 with new innovations and a strong move to the cloud. But from the view of a customer, the world should be getting simpler, not more complex, and they expect products to make deployments faster and easier. Instead of complex, “piece together your own architecture” approaches, 2018 will be a year in which customers can really focus on what’s important – the data and analytics – and not the underlying technologies that support them, whether on-premise, in the cloud, or hybrid. A recent Harvard Business Review showed that 64% of telecommunications C-level executives expect moderate or massive digital disruptions over the next twelve months. Competing in the modern telecommunications industry requires a superior customer experience for digital services to expand their footprint and reduce the threat from over-the-top (OTT) players. No institution wants the fines or bad publicity for supporting money laundering or financing to terrorist or criminal organizations. How can firms deliver an AML reporting and compliance process that delivers comprehensive analytic results and can evolve with changing regulations? The German Cancer Research Center (DKFZ) uses self-service big data analytics to radically improve the genomic research process. Their new insights have allowed them to identify better treatment plans for cancer patients. The BI landscape has evolved from one led by IT into one now led by the business user. This means, data architectures are now built on the fly as potentially interesting data is sourced and models are driven from the data. As a result of the new roles, implications need to be understood by all parties prior to investing in a big data solution. - Why alignment with the business matters? - What will you do with the analytic results? - How do you measure success? Through the analysis of real-life use cases, this webcast will demonstrate the top 3 big data use cases we have seen and how our customers answer these very questions. Hadoop is changing. Despite being Big Data’s poster child for the last several years, changes to Hadoop's architecture mean it can now work for small data too. Data volumes aside, Hadoop is becoming defined more by ecosystem tools that are compatible with its file system and less by its own processing and management capabilities. Datameer makes big data analytics simple, quickly transforming businesses into data-driven organizations. A modern BI platform that combines self-service data integration, preparation, analytics and visualization functionality with enterprise-grade governance and security features, Datameer enables data democratization without chaos. Datameer's familiar spreadsheet interface, powered by the unlimited storage and compute capabilities of Hadoop, allows analysts and subject matter experts to ask entirely new questions of their data that were never possible with traditional BI tools. Hundreds of customers, including CIOs, CMOs, CTOs, doctors, scientists, law enforcement officials, and even Olympic athletes all rely on Datameer to help them get from raw data to insight faster than ever.